I feel like sharing a little bit of where I live. Partially because most of my best friends live very far away and don’t see the little items and spaces that make up my world. sorry if these pictures aren’t the greatest, I don’t have a smartphone. I make do. my neighbors put this in the hallway. it felt poignant. we all live in such tiny spaces here, it seems unsustainable for the long term. 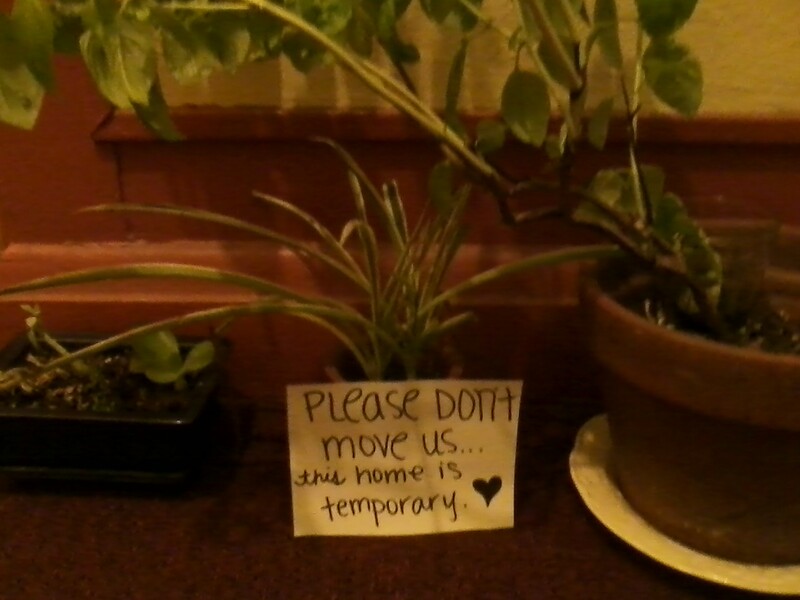 all of our homes are temporary. 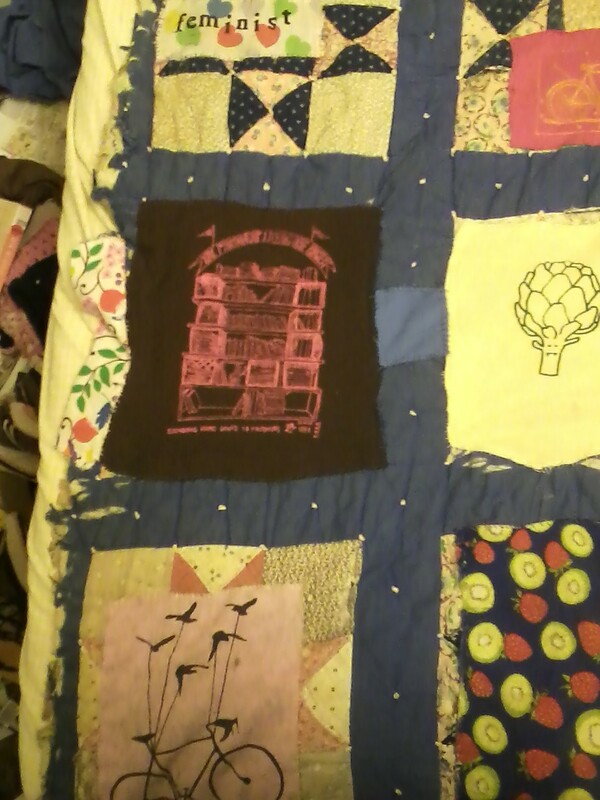 my patchwork quilt that scarin trashpicked over a year ago. it is torn up like hell, and any halfway sensible person would have scrapped it by now. written it off as a lost cause. not me though. I’ve been patching it up, slowly, using patches that no longer seem appropriate, or cloth pads that I don’t need now that I have an IUD, or t-shirts that don’t fit. clockwise from top left, I have a patch that I bought on etsy that happens to be printed on the same sheets I had as a child, a few cliché bike patches, a cute frowny artichoke shirt that was too big, a repurposed former rag with kiwis and strawberries on it, a lovely silkscreen patch of a bike being carried away by birds that I wore on the back of my hoodie for years until it got too mud-splattered and torn, and a t-shirt for the Berkeley Prison Lit Project (which I am a core member of) that emma gave me that is far too small. this is only one corner of this blanket. to capture the whole thing in one photo is hard. it feels nice to lay beneath. the view outside my window. 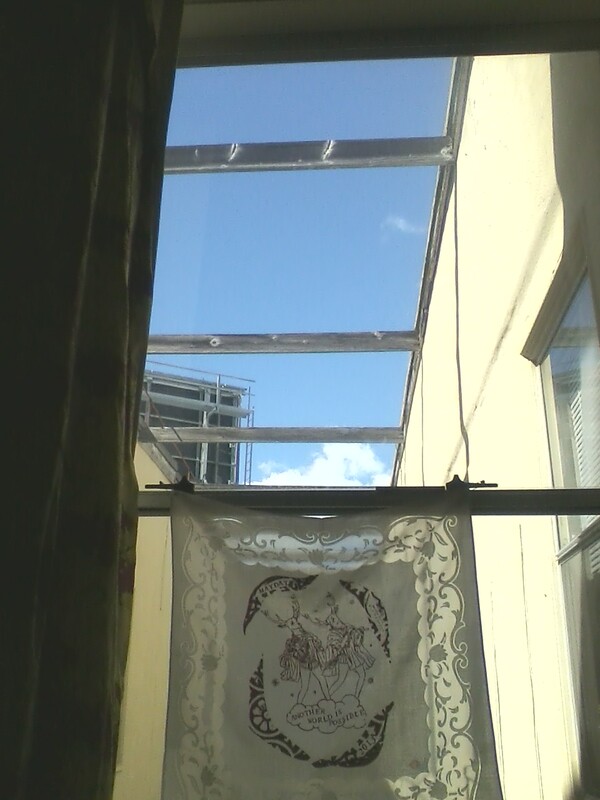 a tiny slice of brilliant blue sky. the scarf says “another world is possible.” etta made it. 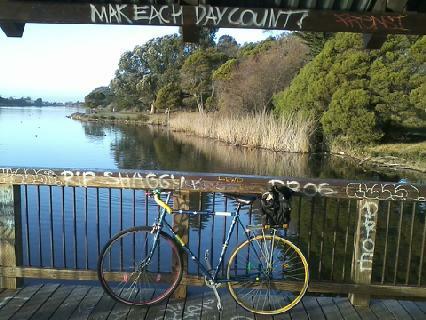 my bike, at aquatic park in berkeley, under some posi graffiti. I live so close to here and I like to go there after an overnight shift, when I’m waking up at 4:30 and desperately need some sunshine on my face. California stuns me, endlessly, with its beauty. 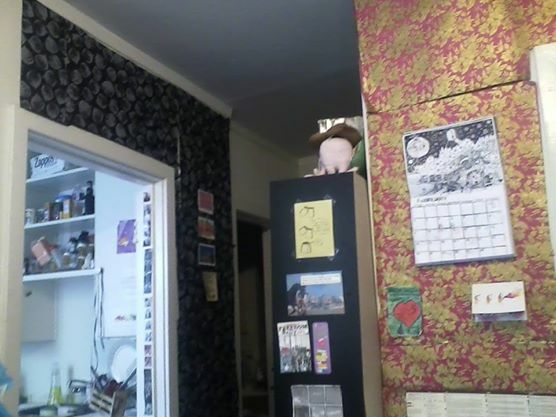 the white walls were upsetting me, so I bought some fancy paper and taped it over the walls. I’m not allowed to paint. it made me feel about a hundred times better! 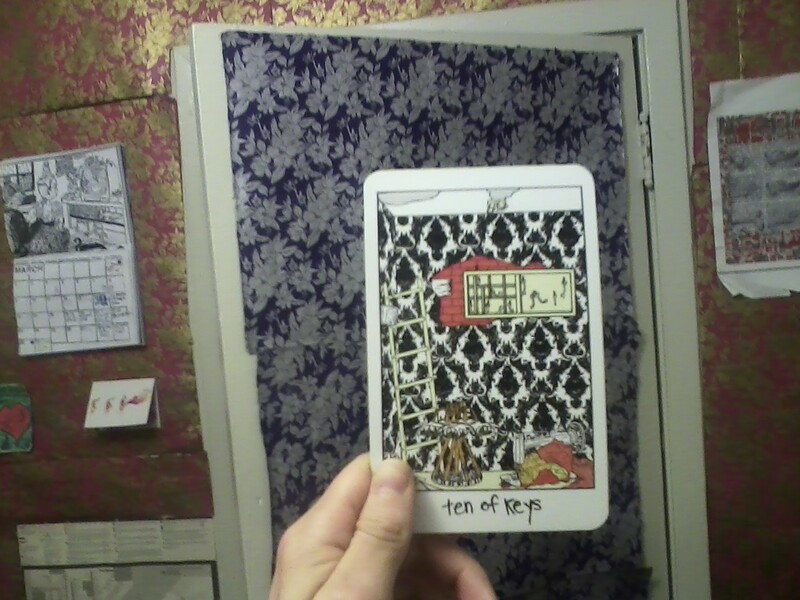 this card, the ten of keys from collective tarot, is the card of burnout. of loving everything you do but stretching yourself far too thin. I feel that card tremendously, and it looks a little bit like my apartment. am I living in the ten of keys? I don’t know. I mean, I have certainly been busier, stretched thinner, but sometimes it doesn’t feel that way. I do an ok job of taking care of myself but there never seems to be enough time. Always exhausted, underslept, my book to-do list is so long and I just don’t know how to do it. Trying to teach my impatient Aries self to take things slowly, slowly. it’s so hard sometimes.